It's that time again, when a city is split in two, families divide and half the squad get booked with 3 sendings off... That's right, it's the Merseyside derby! Year in year out, it never fails to entertain and although Everton are still miles behind with their silverware collection, they're never too far behind over 90 minutes. Everton have had a decent start to the campaign despite losing the influential Arteta. New signings in the likes of Vellios and Drenthe have added a new element to David Moyes' side who will obviously be looking to do one over their neighbours on Saturday. Unavailable for Everton is Victor Anichebe who is out with a groin injury and Tim Cahill is a doubt. For Liverpool we are still without Daniel Agger, though the Dane is back in training. A doubt too is Glen Johnson and we're expecting Gerrard to once again start from the bench. Ian Rush scores in Liverpool's 3-2 FA Cup win. The match started in a solemn fashion as both sets of fans remembered the 96 Liverpool fans who died in the Hillsborough disaster. Everton troubled the Reds in this 90's FA Cup tie, manager Kenny Dalglish saw out his last game as Everton forced a replay after coming back four times in the match. Everton won the replay. This is the last time Everton won at Anfield. In 1999, Kevin Campbell got the winner for the Toffees. Steven Gerrard looks shocked as referee Phil Dowd shows him a second yellow and gives him his marching orders after just 20 minutes on the pitch. Liverpool went on to win the game 3-1. 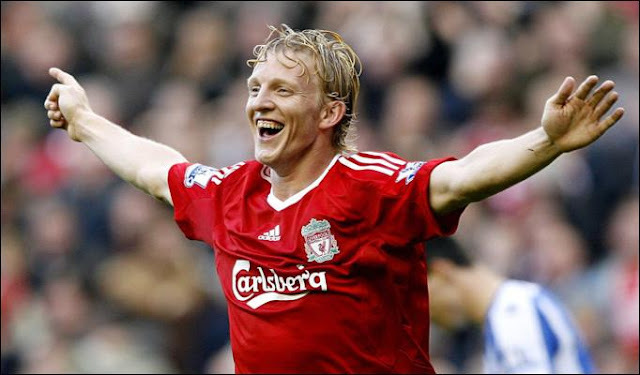 Kuyt converts a penalty in a slim 2-1 victory for Liverpool. Sami Hyypia scored an own goal in the game and Everton's Tony Hibbert was sent off. Liverpool put two past a gallant Wolves side yesterday in an entertaining fixture for the Reds. The first half was pretty much one way traffic but second half substitutions from Mick McCarthy allowed Wolves to get back into the game with a goal from Steven Fletcher. Liverpool opened the scoring with a little dash of magic from lady luck. Charlie Adam saw his chance to have a pop at goal and struck with power, the attempt looked as if it was going wide but Wolves captain Roger Johnson made the decision to stick his head on it and put the ball past Hennessey and into his own net. It was almost laughable because nobody could see why Johnson put his head in the way, whether it was because he didn't have time to think i don't know but it was a bad mistake from the defender. Liverpool travel to the home of the seagulls tomorrow for their league cup fixture against Brighton & Hove Albion. Promoted from league one last season, the seaside club are finding themselves in a bit of good form. The Reds on the other hand will be looking to quickly forget about their embarrassing defeat at the hands of Tottenham Hotspur on the weekend and hopefully progress through the competition. Brighton's perhaps most famous manager was the legendary Brian Clough, after only one season in charge however, he didn't see as much success down South as he did up North. Managerial wise it took until 2009 for Brighton to have a manager from outside the UK and the Republic of Ireland. Gus Poyet who hails from Uruguay is the current manager and most would agree he's doing a splendid job at the moment. Despite 24 shots at goal Liverpool could do nothing yesterday to break through the brick wall of Stoke's defence at the Britannia. The home side put themselves in front with a penalty early on and never looked back. Tony Pulis' boys continue their unbeaten run in their fantastic start to the Premier League season. New signing Craig Bellamy had to settle for a start from the bench and so too did Uruguayan defender Sebastian Coates. Suarez was the main man up front and Jose Enrique gained himself another start in Dalglish's defence. The match unfortunately for Liverpool was marred by penalty decisions and missed chances.